HMS Natal was accepted from the builders on 5th March 1907 at the Chatham Dockyard. Captain Stuart Nicholson was appointed as the first commanding officer, a posting that he held until 14th December 1908. Captain Frederick Charles Ashley Ogilvy was the second commanding officer and was appointed in December 1908. Ogilvy, the son of a Baronet, had had a varied naval career having been promoted to the rank of Commander in March 1900. This was a field promotion in recognition of his service as the Senior Lieutenant of the Naval Brigade at the Relief of Ladysmith in the South African (Boer) War. Unfortunately, Ogilvy’s career as Captain of HMS Natal was cut short when he died of typhoid on 11th December 1909. Ogilvy became seriously ill on the 8th December and Captain William Reginald Hall was appointed on a temporary basis. When Ogilvy died on the 11th December, Hall’s appointment to commanding officer of HMS Natal was confirmed. 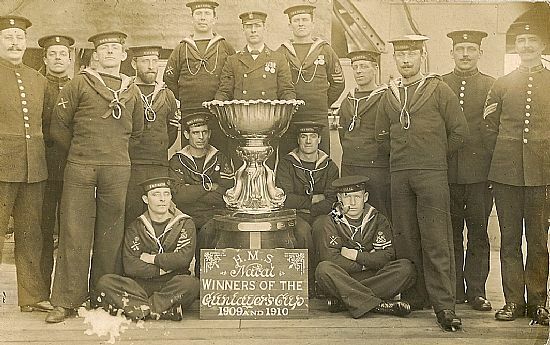 The winners of the Gun-laying Trophy Competition 1909 and 1910. Postcard in the Author's Collection. Besides HMS Natal winning the Gun Laying Trophy, the ship was selected to accompany the Royal Yacht to India with King George V to attend the Dehli Durbah in March 1911. However, Hall’s career with HMS Natal was not all a success. In April 1911 a Court of Inquiry found that he was responsible for the death of Seaman George Smith. Smith was killed by a moving gun turret that did not have a sentry posted to warn approaching men of the danger. Hall’s appointment ended in June 1911 and he was succeeded by Captain Clement Greatorex. Greatorex continued with the work that Hall had initiated in HMS Natal and it was not surprising that the ship was chosen to take the coffin of the American Ambassador back to New York after he had died. This story is told in detail in another section if this site. Greatorex’s appointment ran until May 1913 when he was succeeded by Captain John Fredrick Ernest Green. Captain Green was an officer with an interesting history. He was promoted to Captain in 1906 and the command of HMS Forte in 1908. A Court of Inquiry at the end of 1908 when looking into the terrible result of the gunlayer’s tests, concluded that Green and his officers had not provided enough training or their gun crews. In 1910 another Court of Inquiry expressed its extreme displeasure at the lack of seamanship and disregard for King’s Regulations when HMS Forte ran aground. 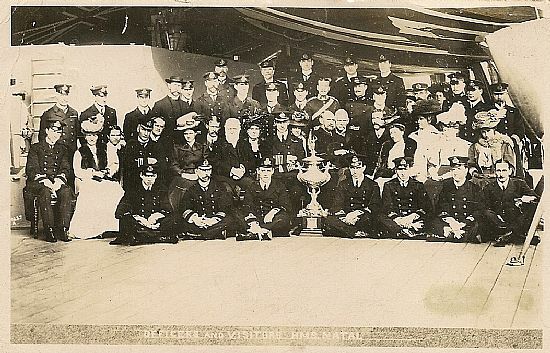 However, Green was appointed as Commanding Officer to HMS Natal in May 1913. But there was another Court of Inquiry in June 1913 when HMS Natal collided with a fishing boat. The conclusion of the Court was that the speed of HMS Natal was excessive (10 Knots) considering the foggy conditions. The Admiralty did not concur with this conclusion and Green was exonerated. Green was still in command of HMS Natal at the outbreak of World War 1 and passed the command to Captain Eric Percy Coventry Back on 5th June 1915. Back was appointed to Natal having been Flag Captain to Admiral Egerton on the Plymouth Station. Captain Back was the last Commanding Officer of HMS Natal.